The Arista 7280E Series are key components of the Arista 7000 Series portfolio of data center switches. 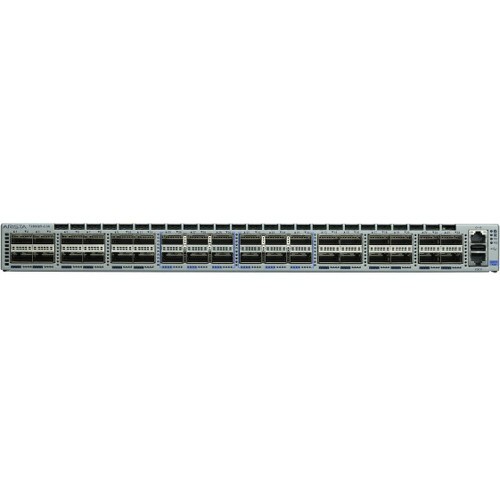 The Arista 7280E series are purpose 10/40/100GbE fixed configuration systems built for the highest performance environments, where wire speed L2 and L3 forwarding are combined with advanced features for network virtualization, open monitoring and network analysis, resiliency and architectural flexibility. The 7280E capabilities address the requirements for modern networking and rich multi-media content delivery requiring a lossless forwarding solution. The 7280E Series are available in three models each with 48 SFP+ ports for 1/10GbE and a choice of 40GbE and 100GbE uplinks. The 7280SE-64 has four QSFP+ uplink ports that allow a choice of four 40GbE or up to 16 additional 10GbE ports with the use of transceivers or cables. The 7280SE-72 delivers two 100GbE uplinks through the use of Arista MXP interfaces and embedded optics. Each MXP port enables twelve 10GbE, three 40GbE or one 100GbE for a wide choice of cost effective connections. The 7280SE-68 has two 100GbE QSFP uplinks that allows for the use of both 100GbE and 40GbE optics for the widest range of both short and long reach connection options, active and passive cables. All models in the 7280E Series deliver rich layer 2 and layer 3 features with wire speed performance up to 1.44 Terabits per second. The Arista 7280E Series offer avirtual output queue architecture combined with an ultra-deep 9GB of packet buffers that eliminates head of line blocking and allows for lossless forwarding undersustained congestion and the most demanding application loads. Combined with Arista EOS the 7280E Series delivers advanced features for HPC, big data, content delivery, cloud and virtualized environments.